Like ButchEgg, we stumbled upon this pub by chance. The pub is a bit like a Tardis; it's a lot bigger inside than you would think from the outside. The bacon and tomato baguette (it was a lunch-time visit) was really good, as was my pint of Wherry. Would certainly not be averse to calling in again. Well worth a visit. Stumbled upon this pub by chance looking for refreshments on the way to North Norfolk. Right by part of the Broads hence the name. 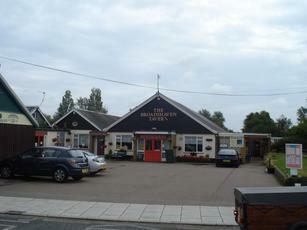 The pub is a haven of large rooms with a bar at the front giving the feel of a clubhouse. Whilst this put me off at first I then tried a half of Adnams Ghostship. This, to me, was a perfect pint. I don't usually drink on long journeys but I had to have a pint of this and it was superb. Followed it with the steak pie which went down very well - a nice large portion - not a stew in a dish. My wife stuck to her salad. An unusual setting for a pub - not exactly in the country as it's surrounded by similar buildings giving the feel of a industrial unit. But if you can forgive that, then it's definately worth the visit. I reckon it could be a nice place to visit over the summer months, the beer is good (I made sure to sample what they have at present, with more due on the way), the food is coming together (they are in the process of finishing the kitchen refit), and hopefully, if more people visit the place, the atmosphere will improve greatly. I'm going to give it a 7 rating for now, as they have only just opened, however it seemed very positive on my visit, and I think that could improve over the coming weeks and months! The Falgate Inn, a proper pub selling proper beer and food.